As you prepare the budget for presentation and passage I hope that you will commit to including the additional Senior Citizen Tax Relief that was approved this winter by the General Assembly. My bill (HB270) was rolled into HB1503 and raises the income eligibility restrictions for tax exemptions for senior citizens and the permanently disabled from $62,000.00 to $67,000.00 for Norfolk residents, effective July 1, 2008. As you’re well aware, property tax increases are still of major concern to all Norfolk residents and since the Homestead Exemption was killed in the Virginia Senate this is one piece of additional tax relief that we can at least provide to our qualifying seniors and disabled residents in Norfolk. A number of folks have asked me when they can expect the income limit to be raised as a result of my bill. I have promised them I would be making the request of city council. The relief is available but the legislation is permissive. PLEASE help ensure additional relief for these seniors by raising the income limit on July 1, 2008. As a follow up to the Beverely murder I am hearing that a lot of people think this is a gang initiation or a random act. I can tell you it was neither. As is common with most murders, this had some underlying factors that tied the killer to the suspect. 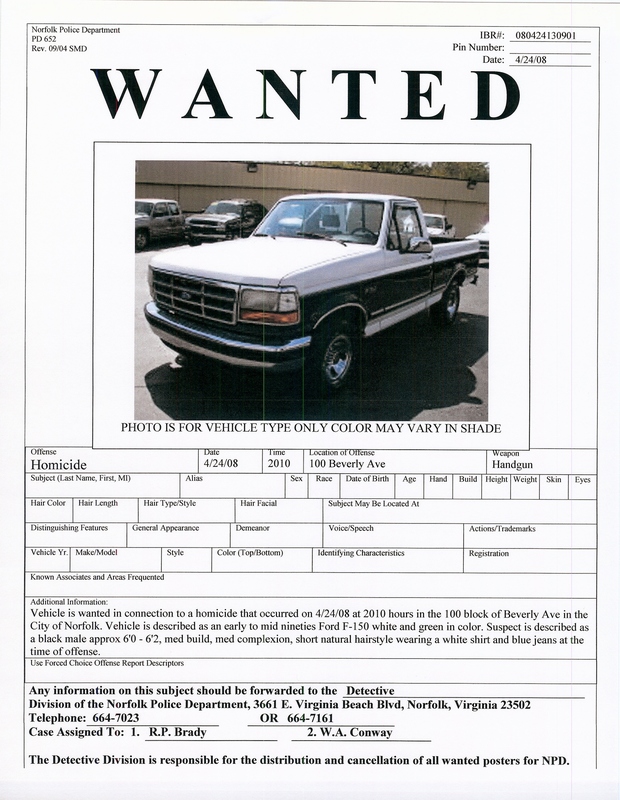 The best help citizens can provide would be any information on the two tone Ford F-150 that was used by the killer. If anyone saw anything related to the murder (especially any license info) that night and has not been reported, please urge them to contact PD. They can contact me 613 8593 or 423-4448 Officer Jackson or Hubbard (823-4478). Hester was named vice-mayor by her colleagues and then ousted, has cast a series of dubious votes, and exhibited at least one troubling ethical lapse. When she threw her support to her friend Alphonso Albert for a high-profile city job, her colleagues were unaware that he was once a violent felon before turning his life around. The result was an unnecessarily polarizing embarrassment for everyone, including Albert, who deserved better. She lost the confidence of her colleagues on City Council, and her position as vice-mayor, after trying to scuttle the long-delayed plan for the direct election of mayor, something citizens had demanded for years. Hester seems, even after so many years in office, insensitive to the obvious potential conflicts of representing a company trying to do business with the Norfolk Public Schools. The Virginian-Pilot was not impressed by Hester’s opponent enough to throw him their support; therefore, they endorsed no one in Ward 7 for council. Winn has been asking hard questions about why commercial assessments haven’t kept pace with soaring residential real estate values and what can be done about it. That disparity, over the past few years, has essentially shifted a heavier portion of the tax burden onto homeowners. In other words, where other politicians talk about taxes, Winn digs into the system and figures out how to make it more responsive. If Wards Corner has not been transformed by the series of changes fostered by Winn and his allies, it has been changed in dozens of little ways over years, one storefront, one apartment complex, one piece of infrastructure at a time. He has been a strenuous supporter of Norfolk’s downtown revitalization, although not a blind one, and has brought smart business sense to the council’s work. Winn has earned re-election. It is very interesting that the editorial staff of the Pilot mentioned Wards Corner twice in its endorsement. Councilman Winn represents dozens of neighborhoods from Downtown to Ocean View. Maybe our work in the Partnership is paying off. Below is a PDF file of the wanted poster for the murderer of Navy Lieutenant Todd Cox. Please print and distribute among your neighbors and post in your businesses. The Virginian Pilot is reporting on a Denby Park resident whose body was found in a tarp in Chesapeake. The body of Lisa Area L’Minggio, of the 300 block of San Antonio Blvd., was discovered by construction workers about 11:15 a.m., according to Chesapeake police. From a source that must remain anonymous, we have gotten a sketchy description of the suspect and the vehicle he was driving when he murdered Lt. Todd Cox. The suspect is a black male driving what was described as a green Ford F-150. It is doubtful that this murder was gang related as only one individual was involved. Motive has yet to be determined. As new information arrives, it will be posted on www.wardscornernow.com. Pilot Online reports that there still is no arrest in the murder of Navy Lieutenant Todd Cox on Beverly Avenue. Lt. Cox was shot at point blank range. The murderer continued to fire bullets into Lt. Cox after he fell to the ground. This murder took place as Lt. Cox was walking with his fiance and two children. A funeral Mass for Lt. Cox will be conducted at 11 a.m. Tuesday at Blessed Sacrament Catholic Church located at 6400 Newport Ave. in Norfolk. The family has asked that memorial contributions be made to the United Cerebral Palsy Association, 1660 L St., NW, Suite 700, Washington, DC 20036. You are currently browsing the Wards Corner Now - Wards Corner, Norfolk, Virginia blog archives for April, 2008.